Without the shadowy help of Rose O’Neal Greenhow, the Confederacy would have been hard-pressed to win the First Battle of Bull Run. “But for you, there would have been no Battle of Bull Run.” When Confederate President Jefferson Davis made that blanket statement in the summer of 1862, he was not addressing Pierre G.T. Beauregard, Joseph E. Johnston, or any of his other generals who had taken part in the war’s first major battle in July 1861. Instead, he was talking to a slightly built widow in her mid-40s who had never seen the Virginia battlefield. Rose O’Neal was born in 1817 into a wealthy family in Montgomery County, Md. With her husband, Dr. Robert Greenhow, and their growing family, she travelled throughout the United States until 1854, when Dr. Greenhow died in California. Instead of staying in the West, Greenhow decided to move back to the Washington, D.C., area with her four daughters. Despite her continued visits to the White House, Greenhow was anything but a supporter of Lincoln and his new Republican government. Her parents had been slave owners, and her father had been murdered by one of his slaves. Like the rest of her family, she was avidly pro-slavery and anti-abolitionist. When the southern states began seceding from the Union, Greenhow became an open supporter of the new Confederacy. The organization looked fine on paper, and Greenhow’s operatives soon began passing information between Washington and Confederate intelligence personnel in Virginia. But the first real opportunity for her spy network to prove itself came in July 1861. After the Confederacy had decided to transfer its Congress from Montgomery, Ala., to Richmond, Va., Abraham Lincoln called a cabinet meeting attended by several generals, including 75-year-old General Winfield Scott, the commanding general of the United States Army. The purpose of the meeting was to determine what should be done about a Confederate force that had assembled in the vicinity of Manassas Junction, about 25 miles west of Washington. Scott suggested that the Confederates, under the command of General Pierre G.T. Beauregard, should be attacked and dispersed, and that the attack should be led by Brig. Gen. Irvin McDowell, with a force of just over 30,000 men. Greenhow’s operatives soon got word of the Union intentions, and they were able to gather all the information that Beauregard needed to know about the enemy. Thanks to Greenhow and her spies, Beauregard even had a copy of the orders that McDowell had issued to his troops. Johnston was informed of the impending battle and ordered to go to Beauregard’s immediate assistance. Because of Greenhow’s warning, Johnston was able to start for Manassas before Union troops could do anything about it. 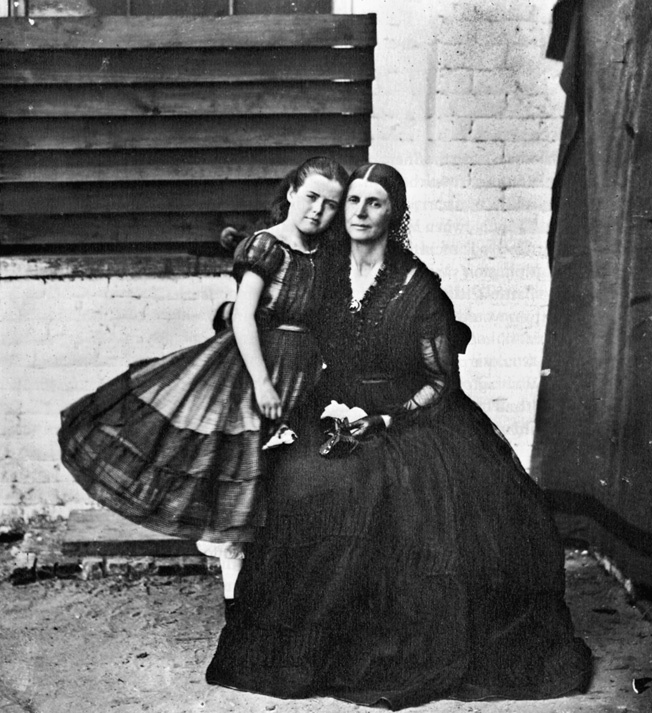 Rose O’Neal Greenhow and her daughter in a photo taken while she was confined by the Union in 1862. Immediately after the battle Greenhow received another note, this one from the Confederate government at Richmond: “Our President and our General direct me to thank you. The Confederacy owes you a debt.” It did indeed. Without her intelligence, Johnston’s men would never have reached Manassas on time, and the battle—and possibly the war—would have had a far different outcome. After the rout at Bull Run, Winfield Scott was replaced as overall commander by Maj. Gen. George B. McClellan. McClellan brought his own personal spy with him, a Scottish immigrant named Allan Pinkerton. Pinkerton had become the first professional detective in Chicago in 1850, and had made a reputation for himself as one of the top detectives in the country. At the end of July 1861, he was given the assignment of keeping Greenhow under surveillance. Along with two assistants, Pinkerton took up position outside Greenhow’s house. He had been watching for only a few minutes—although in heavy rain it seemed a lot longer—when a visitor entered the house. Pinkerton recognized the visitor as an infantry captain he had met for the first time that same day. He identified the officer as “Captain Ellison,” although that was not the man’s real name. At about 12:30 in the morning, Ellison finally left Greenhow’s house and returned to his post. The captain’s real identity was John Elwood of the 5th U.S. Infantry. Pinkerton related his information to Assistant Secretary of War Thomas A. Scott, who questioned the captain and had him placed under arrest. Following this, Pinkerton returned to Greenhow’s residence to resume his surveillance. Although Greenhow knew by then that Ellison/Elwood had been apprehended, she carried on with her activities as though nothing had happened, while the evidence against her increased. On August 23, 1861, she was placed under house arrest, and later held in the Old Capitol Prison. Even in captivity Greenhow was able to continue spying for the South due to the inattention of her guards, sending coded messages to Confederate agents. In June 1862 she was exchanged for several Union prisoners of war. When she and her daughter arrived in Richmond they were welcomed personally by President Jefferson Davis. Tags Abraham Lincoln, Allan Pinkerton, Battle of Bull Run, Confederacy, espionage, First Battle of Manassas, Fort Sumter, general george mcclellan, general joseph e johnston, irvin mcdowell, James Buchanan, Jefferson Davis, Manassas, Richmond, Shenandoah Valley, Stonewall Jackson, Union Army, Union Navy, Winfield Scott.